The scale of both the opportunities and the challenges facing the Humber economy were set out as a huge skills event opened in Hull. Humber Local Enterprise Partnership (LEP) Chief Executive Kishor Tailor launched the Skills Show Experience at Hull College by underlining the jobs potential from unprecedented investment into the Humber. But he also stressed the importance of training and education opportunities which are directly relevant to the region’s employment prospects. Those prospects are truly unprecedented and relatively imminent. Mr Tailor said 1,000 jobs would be created at the planned Siemens offshore wind manufacturing facilities at Alexandra Dock in Hull and on the site’s eastern boundary at Paull. A further 2,000 jobs will be produced if the giant Able Marine Energy Park at North Killingholme on the south bank, currently the subject of a planning wrangle, goes ahead. The multiplier effect would mean those numbers would be boosted by five or six times as many indirect jobs. In all, 15-20,000 new jobs related to the burgeoning offshore wind industry alone would be created in the region. Those jobs will start to come through in 2017 when the planned Siemens plants are due to become operational, so there is no time to waste in developing a workforce to seize the opportunities. The key, said Mr Tailor, would be training and education opportunities in STEM (science, technology, engineering and maths) subjects linked to engineering and manufacturing. Those STEM subjects and related careers are the core focus of the Skills Show Experience, the largest of a national programme of more than 200 events presenting “have a go” opportunities to school leavers, students and mature workers. The event is expected to attract 2,000 visitors. It brings together Hull College, other training providers and also leading local employers, such as safety equipment business Arco, to offer a host of practical opportunities to discover a wide range of vocational, skills-based careers, including engineering, renewables, welding and construction, digital industries and the visitor economy. The choice of Mr Tailor to open the event was certainly appropriate as many of the activities mirror the skills required by priority sectors identified by the LEP as the key drivers of the region’s economy. 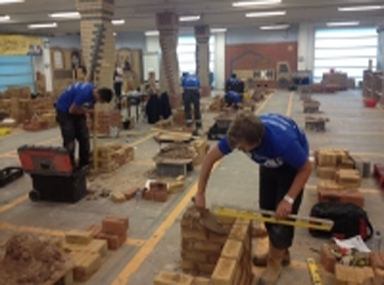 A centrepiece of the event on the first day was the Yorkshire and Humber final of SkillBuild, the country’s largest multi-trade competition for construction trainees and apprentices. Almost 100 young construction workers spent the day working on test plans, with the highest scorers going forward to the national final in November. Traditional skills are complemented by the latest manufacturing and assembly line technology, showcased within a specially-commissioned 17-metre trailer called MANTRA, packed with cutting-edge equipment, including 3D virtual reality training aids, provided by the University of Sheffield’s Advanced Manufacturing Research Centre (AMRC). The event has made the Hull College campus a hive of activity. Everywhere, students and adult visitors are encouraged to get hands on. The event runs until Thursday, June 26, and Hull College Principal Graham Towse urged people to seize the opportunity. “I really want to encourage people to come and see what it’s all about,” he said. “It’s a rare opportunity to explore a new career, whether it’s something you’ve always dreamed of, or a trade you have been curious about but never had the opportunity to try. “There is a huge amount going on over the course of the three days, from live demonstrations and presentations to the ‘have a go’ activities that are at the heart of the event. As the Humber anticipates a golden era of opportunity, investors, employers and training providers all agree that developing a workforce with the relevant skills is the first and foremost priority. Those skills are overwhelmingly vocational and practical – exactly the kind that the Skills Show Experience is enabling hundreds of people to sample on the Hull College campus.